PM #40762529 $5.00 • Vol. 29, No. 18 May 28, 2018 L AW TIMES C O V E R I N G O N T A R I O ' S L E G A L S C E N E • W W W . L A W T I M E S N E W S . C O M OCA ruling to influence firing decisions by employers Lorne Sabsay says an Ontario Court of Appeal ruling shows employers that, 'if they want to terminate, that decision must be taken fairly.' Photo: Robin Kuniski LICENSING REPORT Alternatives to articling being considered P4 LEGAL INSURANCE Viable option for family law matters P7 FOCUS ON Labour & Employment Law P8 BY MICHAEL MCKIERNAN For Law Times E mployment lawyers say an Ontario Court of Appeal decision endorsing the ap- plication of the good faith doctrine in the performance of ter- mination clauses injects a measure of fairness into firing decisions. The decision in Mohamed v. Information Systems Architects Inc. involved an independent contractor agreement between security engineer Mitchum Mo- hamed and technology consulting company ISA, which had its own contract to carry out work for Ca- nadian Tire. Mohamed sued after he was fired just weeks into the six- month contract when Canadian Tire found out about a historic criminal conviction that he had previously disclosed to ISA. Despite the broad discretion the contract gave ISA to terminate, the unanimous three-judge appeal court panel agreed with Ontario Superior Court Justice Paul Per- ell's earlier decision to rule sum- marily in favour of Mohamed. "Although the appellant had a facially unfettered right to termi- nate the contract, it had an obli- gation to perform the contract in good faith and therefore to exercise its right to terminate the contract only in good faith," Appeal Court Justice Kathryn Feldman wrote on behalf of the court in its May 7 judgment. "In my view, the motion judge made no error in concluding that the appellant breached its ob- ligation." Lorne Sabsay, who acted for Mohamed at the appeal court, says both he and his client were "very happy" with the result. "Our position from the begin- ning was that the termination was fundamentally unfair," says Sab- say, a partner at Toronto firm Sab- say Lawyers. "It struck me that the case was decided in part at the Superior Court level, and definitely at the appeal court level, on the basis of fairness. The lesson for employers is that if they want to terminate, that decision must be taken fairly." According to the appeal court decision, Mohamed left a full-time permanent position to take up the temporary six-month posting in November 2015, but only after in- forming ISA about an old criminal conviction he picked up during his high school days around the turn of the century. 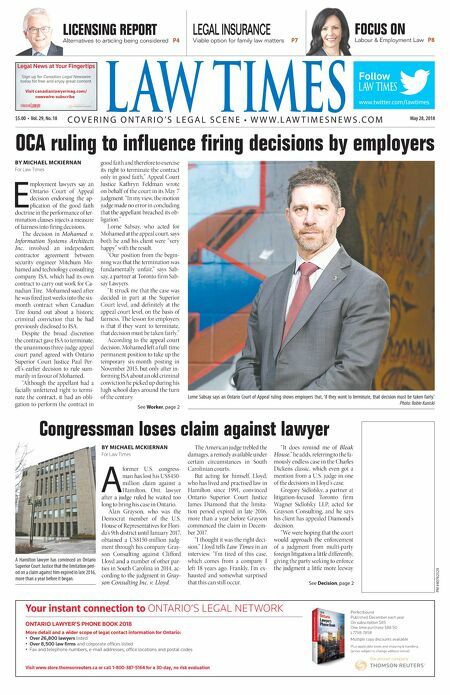 See Worker, page 2 Congressman loses claim against lawyer BY MICHAEL MCKIERNAN For Law Times A former U.S. congress- man has lost his US$450- million claim against a Hamilton, Ont. lawyer after a judge ruled he waited too long to bring his case in Ontario. Alan Grayson, who was the Democrat member of the U.S. House of Representatives for Flori- da's 9th district until January 2017, obtained a US$150-million judg- ment through his company Gray- son Consulting against Clifford Lloyd and a number of other par- ties in South Carolina in 2014, ac- cording to the judgment in Gray- son Consulting Inc. v. Lloyd. The American judge trebled the damages, a remedy available under certain circumstances in South Carolinian courts. But acting for himself, Lloyd, who has lived and practised law in Hamilton since 1991, convinced Ontario Superior Court Justice James Diamond that the limita- tion period expired in late 2016, more than a year before Grayson commenced the claim in Decem- ber 2017. "I thought it was the right deci- sion," Lloyd tells Law Times in an interview. "I'm tired of this case, which comes from a company I left 18 years ago. Frankly, I'm ex- hausted and somewhat surprised that this can still occur. "It does remind me of Bleak House," he adds, referring to the fa- mously endless case in the Charles Dickens classic, which even got a mention from a U.S. judge in one of the decisions in Lloyd's case. Gregory Sidlofsky, a partner at litigation-focused Toronto firm Wagner Sidlofsky LLP, acted for Grayson Consulting, and he says his client has appealed Diamond's decision. "We were hoping that the court would approach the enforcement of a judgment from multi-party foreign litigation a little differently, giving the party seeking to enforce the judgment a little more leeway See Decision, page 2 www.twitter.com/lawtimes Follow Legal News at Your Fingertips Sign up for Canadian Legal Newswire today for free and enjoy great content. Visit canadianlawyermag.com/ newswire-subscribe ntitled-6 1 2018-05-22 4:29 PM Visit www.store.thomsonreuters.ca or call 1-800-387-5164 for a 30-day, no risk evaluation ONTARIO LAWYER'S PHONE BOOK 2018 More detail and a wider scope of legal contact information for Ontario: • Over 26,800 lawyers listed • Over 8,500 law firms and corporate offices listed • Fax and telephone numbers, e-mail addresses, office locations and postal codes Perfectbound Published December each year On subscription $85 One time purchase $88.50 L7798-7858 Multiple copy discounts available Plus applicable taxes and shipping & handling. (prices subject to change without notice) Your instant connection to ONTARIO'S LEGAL NETWORK Untitled-1 1 2018-05-22 10:32 AM A Hamilton lawyer has convinced an Ontario Superior Court Justice that the limitation peri- od on a claim against him expired in late 2016, more than a year before it began.